Giving Soaps bath & body products are not just amazingly good-smelling (they are), but they help keep the environment going strong and give back to charities working worldwide. I LOVED the products sent to me to review. The wonder, Kristie, sent me some amazing things to try and I want to take the time to review each item she sent. I first one to say, the time that was put into packaging the product was noticeable. A little note came on the box, letting me know the box might look a little banged up, but it was being reused. When I opened the box, it was full of shredded paper and the products I was trying were through out all the shredded paper. It is a tad messy when digging through the box to try and find everything inside, but as I dug around, all the smells made me smile. I LOVED this lotion. I got the medium size jar and I've used it every day. Even my daughter who has been complaining of dry skin and didn't want to use her usual lotion because she said it didn't really help. She tried this and she's always asking where the jar of lotion is. The scent is strong but not over powering. It was a lotion that I felt really absorbed into my skin and I didn't need to reapply repeatedly through out the day. I also just felt good using it because I knew the ingredients in it were clean. I have getting the Almond and Cherry Bark lotion on my wish list. I looked over this item at first, to be honest. I'm not diabetic, so I sorta set this aside. 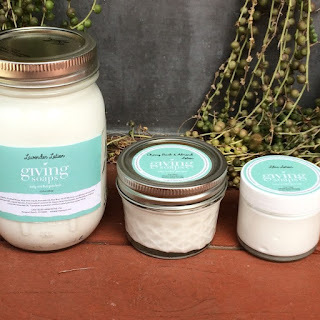 But one evening, I was getting ready to grab the Jasmine Lotion from Giving Soaps to apply to my dry feet and then decided to have a loot at the foot balm. Kristie writes a note with each order, so I read over what the foot balm was for and saw that even though it has ingredients in to geared for diabetics to make it safe for them, anyone could use it. So I popped it open and used a little on my feet. It massaged in really well and absorbed quickly. I wasn't a fan of the scent but I really liked how much it helped with my dry skin that I'd use it again. Love this stuff. I suffer from headaches and I'm not new to using essential oils for headaches. I have a tension blend of I usually roll on to my temple and neck when I have a headache. I was excited to try the one Kristie sent. What I really liked about this one over the one I have is the smell is not as strong and it doesn't burn. Sometimes when I apply my other one, it burns my skin a bit. But this went on smooth, a very light scent coming from it, which I needed during a migraine, and in about 15 minutes, it really did start to ease my headache. I've sense put aside the blend I was using before and I keep the Headache Eraser from Giving Soaps close by. She sent me a variety of bar soaps to try and so far I've only tried one. The Cherry Bark and Almond (another reason I need the matching lotion). I have to be honest, I've never used homemade soap before. I've always been a body wash person because soap leaves my skin feeling different than body wash. But I gave this a try. I keep the bar of soap in the Soap Sweater she provided. It lathers up really good and glides over my skin. I LOVE the way it smells and always hope I leave the shower still smelling like the soap. I've been using it over a week now and the soap bar is holding up. The only thing I noticed is I keep the soap in the soap sweater and hang it to dry. the bottom of the soap is getting a little smushy, so I'm not sure if that's normal, as I've never used this kind of soap before. 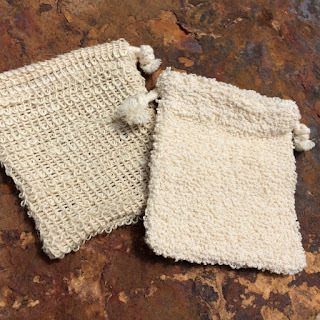 The smushy factor doesn't effect use as it's in the soap sweater. The soap sweater. This thing is awesome. You pop the bar of soap in it, close the bag, get it wet, lather, and go over your skin. Then rinse it off and hang dry. No holding the soap and it slipping from your hands. It's made using bar soap an easy transition for me, coming from the fact that I only used body wash before. Kristie left me a note that in each order, she includes a gift and she wanted to do that for me as well. So she included a "One of those day" bath bombs. I used it on "One of those days", my back was aching and I was just feeling tired. So that evening, I turned on the tub, got it hot the way I like it and before climbing in, dropped the bath bomb in. It fizzled and let out a great smell of peppermint and eucalyptus. Perfect for a cold. But it really helped my back feel better. It's also filled with herbs and that filled the water. My bathroom smelled heavenly for days. Thank you for the bonus gift. 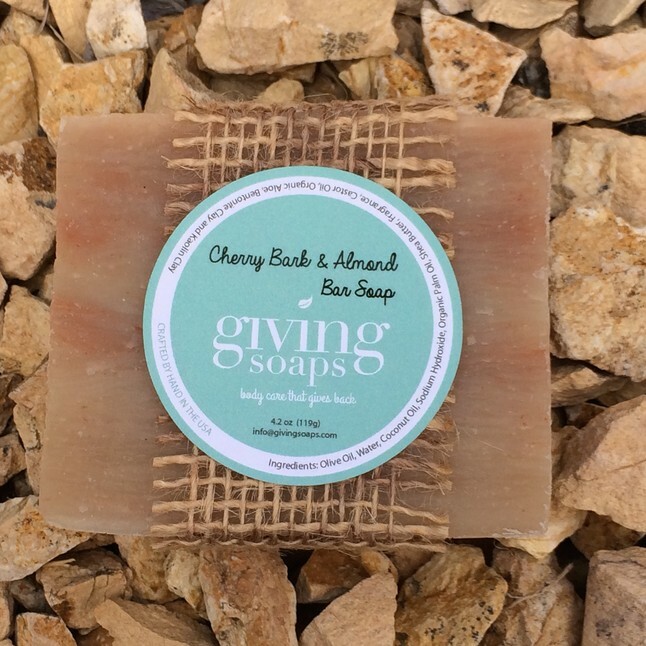 One lucky winner is going to receive a $25 store credit to Giving Soaps! To enter, just fill out the Giveaway Tools form below. This giveaway will end 10/27/16 and is open to the US only. The winner will be notified via email and will have 48 hours to reply. Thanks again to the sponsor for offering this great prize! I don't like floral scents - they give me a headache. I like fresh or fruity scents. The Cherry Bark and Almond you tried sounds fantastic. I like a lot of scents. I love lavender and cherry blossom, to name a couple. I love different vanilla scented soaps best. I like peppermint scented soaps. I also like baby scented soaps. I like floral and minty scented soaps. I think the Peppermint Tea Tree Bar Soap sounds nice. I like citrus scents, they wake me up when I take my morning shower. I like fruity scent soaps the best. I love lemongrass scented soaps/washes. That would be lavender usually. Now that you mentioned Jasmine though I do remember how much I adore that scent. I think my favorite soap scent is lavender. I think I'd like the aloe calendula scent the best. I really love patchouli scented soaps. I am not crazy about the scent in general but love it in soap. I prefer fresh bracing scents like mint or pine, something herbal. I love the soap scent lavender it smells so good. Pomegranate is my favorite even though I don't find it often! I love lavender scented soap. My favorite soap scent is vanilla. I also really like tropical scents, like pina colada! My favorite scent of soap is coconut. I like vanilla or coconut soap. I think I would most enjoy the cinnamon almond scent! My favorite soap scent is peppermint. I love peppermint or rose scents. I love apple scented anything. I love vanilla or citrus scented soaps. I really like citrusy and tropical scents, they're refreshing and invigorating.